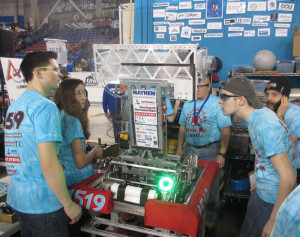 On April 13-16, Mechanical Mayhem competed in the New England District Championship hosted at the XL Center in Hartford, CT.
After an intense 12-match qualification phase, Mayhem held 11 wins and one loss, landing Lady Launch-a-Lot (our robot) in the third seed position. As alliance selection began, our team picked The Gaelhawks (230) from Shelton, CT, and Aces High (176) from Windsor Locks, CT. 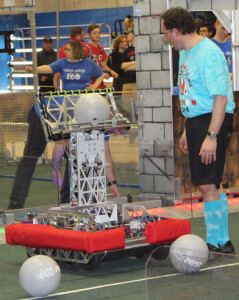 This alliance breezed through the quarterfinals and set a world high score of 257 points in the process. 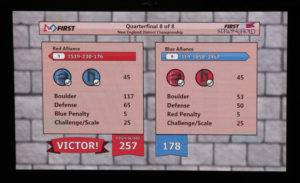 However, our alliance faced tough competition from the second-seeded alliance (The Nutrons, 125; The CyberKnights, 195; and the Aluminum Falcons, 2168) in the semi-final matches that our team will remember forever. 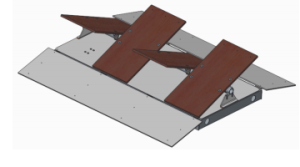 In the first semi-final match, our robot’s boulder pickup mechanism was damaged in an ugly collision with an opponent robot. 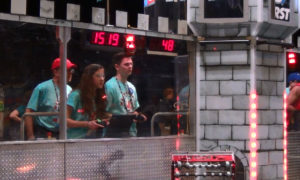 With our harvesting mechanism damaged severely, the drive team decided to switch to defense — a move that our robot drivers had never tried, even in practice. Due to this inexperience, Lady Launch-a-Lot made several defensive errors that eventually cost us the match. 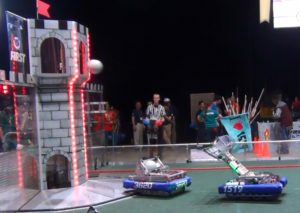 In the second semi-final match, our alliance competed well but lost the match by a mere three points — or so we thought. Thanks to a team alumnus watching the live webcast, Mayhem realized that our alliance had been credited five points fewer than it had earned. Upon discussing the match, the referees decided that a match replay would be the fair way to fix the error. Coincidentally, the match replay needed to be replayed! After nearly an hour of tournament delays, our alliance lost fair and square to these competitors, who eventually won the event. 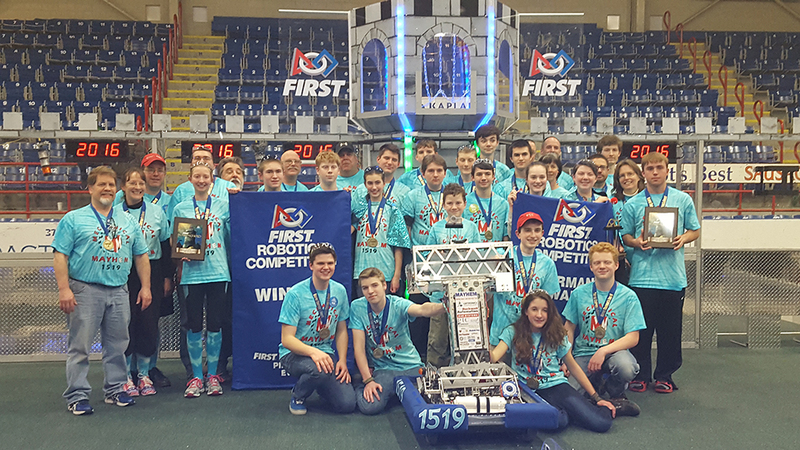 Congratulations to Teams 125, 195, and 2168 on your New England District Championship win! At the culmination of the Awards Ceremony, Mechanical Mayhem was thrilled to be named one of four Chairman’s Award winners out of the 181 New England teams! We would like to extend our sincere congratulations to our fellow Chairman’s Award winners: Gaelhawks (230), Infinite Loop (2648), and Robockets (4761). We feel truly blessed and humbled to be included in such an exemplary group of teams. 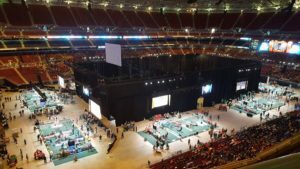 Our team’s performance qualifies us to compete for the Chairman’s Award and with our robot Lady Launch-a-Lot at the World Championship in St. Louis, MO, on April 27-30. As this trip comprises a major expense for the team, would you consider sponsoring our team or increasing your sponsorship? It’s not too late, and no donation is too small! Thank you for your support. 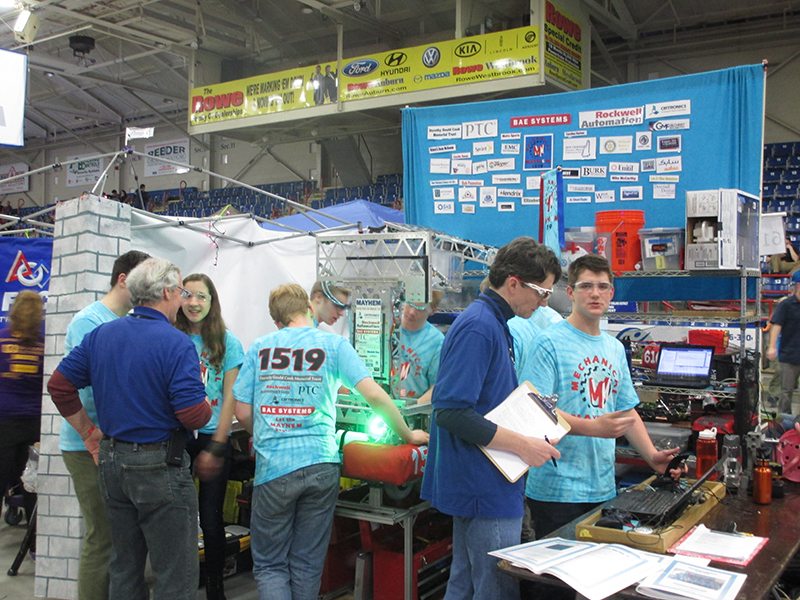 On April 7-9, Mechanical Mayhem participated in the Pine Tree District Event in Lewiston, ME, the second official tournament at which Mayhem competed during the 2016 season. Mechanical Mayhem competed in 12 qualification matches with randomly selected partners and opponents. At the end of these matches, Mayhem was undefeated, with a win-loss-tie record of 12-0-0, placing us in the first seed position. Armed with the privilege of first pick, Mayhem selected team B.E.R.T (133) from Standish, ME, for their sharp-shooter, consistent scaler, and high-scoring autonomous routines. Mayhem also selected Hyde Phoenix (5633) from Bath, ME, to join our alliance as a defense robot. 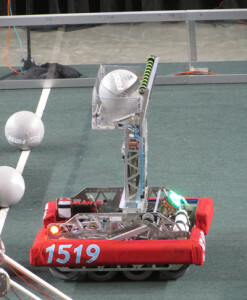 This alliance worked together effectively, winning the elimination matches without a single loss! In addition to winning the robot element of the competition, Mechanical Mayhem took home FIRST’s most prestigious award — the Chairman’s Award. This award recognizes teams whose impacts on their participants, communities, and sponsors are exemplary. We encourage you to view our Chairman’s Video to learn about our outreach. MAYHEM is honored to have been recognized with this award, and we are equally honored to have gone “Double Blue” (won both the Event Winner and Chairman’s Award blue banners) at this event! The Pine Tree District Event marked two Mayhem team records: Firstly, it was the first tournament in which we won every match, both in the qualification and elimination phases of the event. Secondly, it marked the first time that we won twice with another team — Mayhem won with B.E.R.T. way back in 2006! Because of the success of our robot and our Chairman’s Award win, Mayhem will move to the next level of competition and will be competing for the Chairman’s Award at the New England District Championship in Hartford, CT, on April 13-16. Would you consider sponsoring our team or increasing your sponsorship as we prepare for the District Championships? It’s not too late! Please visit our sponsor information page. Without our sponsors, opportunities like Mayhem would simply not be available. We sincerely thank you for your support.